Lensbaby has announced its Trio 28, a new three-in-one optic for FujiX, Micro 4/3 and Sony E mounts. The three lenses built into the turret of the Trio 28 provide versions of Lensbaby's most popular specialty lenses: Twist, Velvet or Sweet. Lensbaby optics usually vary their effect with a change of aperture with wider apertures providing the most dramatic effect. 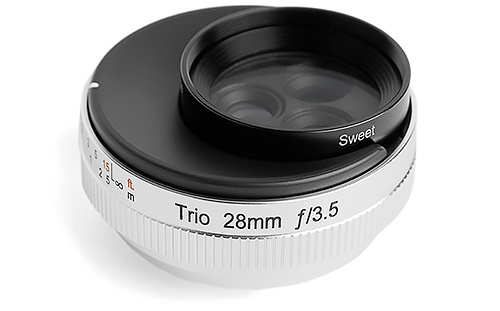 The Trio 28 has just one aperture but at f3.5 it's wide enough to provide a noticeable effect. Rotating the turret moves each optic in succession into the center of the Trio 28, lining it up with the camera sensor. "Trio 28 offers a revolutionary shooting experience for mirrorless shooters," said Lensbaby Co-Founder and CEO Craig Strong. "This is the first lens we've designed specifically with the mirrorless camera's small form factor in mind. 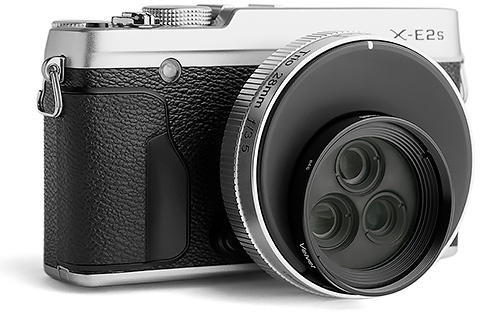 With mirrorless camera sales continuing to grow, this was a natural next step for Lensbaby. "Our goal is to help photographers discover their unique visual voice through the creative freedom our lenses offer," Strong continued. "With a variety of selective focus effects in a compact lens designed for the small form factor of mirrorless cameras, Trio 28 goes above and beyond, helping us reach this goal. We can't wait to see what photographers create with it." The lens is shipped with both front and rear lens caps, a microfiber bag and a user guide. The Trio 28 will be available Oct. 26 for $279.95, the company said. It's available for pre-order now on the Lensbaby site. PORTLAND, Ore. -- Lensbaby, makers of award-winning creative effects lenses, optics and accessories, announces the launch of its most versatile lens yet, Trio 28. Designed specifically for mirrorless camera users, Trio 28 features three selective focus optics in one compact lens and will be available for purchase on Oct. 26. "Trio 28 offers a revolutionary shooting experience for mirrorless shooters," said Lensbaby Co-Founder and CEO Craig Strong. "This is the first lens we've designed specifically with the mirrorless camera's small form factor in mind.[! ]With mirrorless camera sales[! ]continuing to grow, this was a natural next step for Lensbaby." When shooting on full frame cameras, Twist will produce a subtle vignette. The Trio 28 is designed for the following mirrorless cameras: Sony E, Micro 4/3 and Fuji X. It retails for $279.95 and will be available for purchase at Lensbaby.com and other Lensbaby-authorized retailers on Oct. 26.